One week ago, the building many of us know as Parliament closed its doors for more than just a nightly cleaning. Centre Block, the building which has housed the House of Commons and Senate since 1921, began its restoration and renovation process on 28 January 2019. For what will most likely the better part of the next two decades, Members of Parliament and Senators will sit in new homes: West Block and the Senate of Canada Building (which was formerly called the Government Conference Centre and was once Ottawa’s Central Station). Many have worried that the closing of Centre Block will have tremendous repercussions on Canadian democracy. What will happen when one of the most iconic buildings in the country becomes inaccessible for decades? What will this mean for the future of Canadian politics? The closing of Centre Block means the start of a new era. No longer will the media share the well-recognized pictures of the Prime Minister walking down the prime ministerial stairs en route to the House of Commons for Question Period. Parliamentary guides will no longer see the awestruck faces of visitors as they walk into the Library of Parliament or see the view from the Peace Tower for the first time. The closure of such an iconic building brings with it many changes. With respect to the democratic system, however, there will be no effect. Canada’s Parliament will continue to make laws, discuss policy and represent the interests of all Canadians, despite the fact that both chambers no longer share a building. Wellington Street may now separate Canada’s two legislative houses but it will not divide the country’s democracy. What Will Change and What Will Stay the Same? Centre Block has often been dubbed the Parliament of Canada – it is the biggest symbol of the country’s democracy. In reality, although it has immense historical significance and is an icon of Canadian politics, Centre Block is simply the building that houses the Canadian Parliament, meaning the two legislative chambers. What is closing for the next 10 to 15 years is not the Parliament of Canada, but rather the building that has housed the House of Commons and Senate almost continuously since Confederation in 1867. As such, Canadians should not fear for the future of their democracy. Parliament is simply moving to West Block and the Senate of Canada Building. While Canada’s government will carry on relatively undisturbed, some things will change. In fact, uncertainty continues to prevail over the future of parliamentary traditions and ceremonies, particularly those that require Parliamentarians to march between the two chambers. How will the Speech from the Throne occur now that the two legislative chambers are separated by Wellington Street rather than the Hall of Honour? Will the Usher of the Black Rod physically march up the busy street to summon all of the Members of Parliament to the Upper House? Will all 338 Members of Parliament follow him back from West Block to the Senate of Canada Building, once again walking down the bustling street of Canada’s capital city? Will traffic have to be stopped for the duration of these ceremonies? The same questions can also be asked about Royal Assent – yet another ceremony which requires the physical movement of parliamentarians between the chambers. Although only time will provide answers to these logistical questions about the intricate ceremonies and traditions that prevail in the Canadian Parliament, one thing remains certain. Centre Block may be closing its doors to the public and parliamentarians but the Parliament of Canada remains open for business. 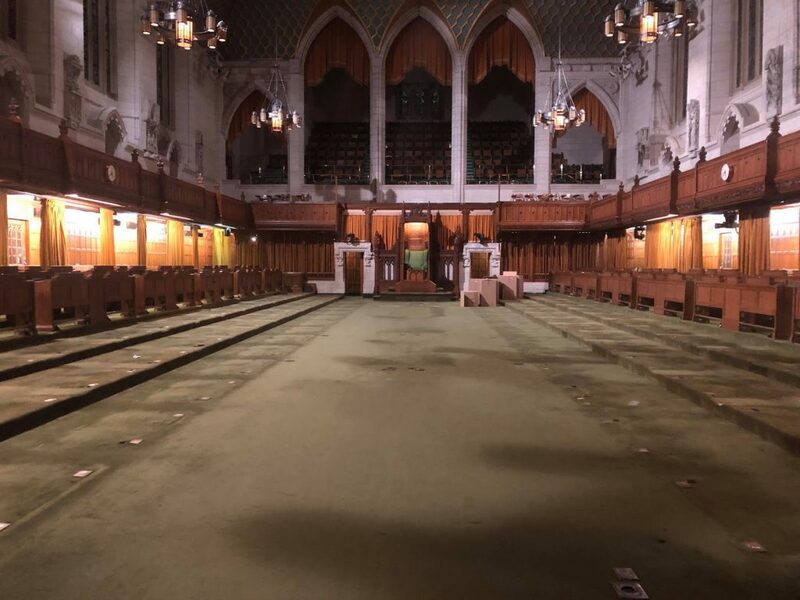 The original House of Commons is nearly emptied as furniture is moved to the new location in West Block. Photo by Katherine Cuplinskas. So Then, What Exactly Are They Doing to Centre Block? The democratic system in Canada will not be harmed by the relocation of the House of Commons and Senate, although it may complicate certain century-old traditions. The question now, however, begs: what exactly will happen to Centre Block? Why is this move necessary? The answer to this question can be found in the history of the building, which first opened its doors to parliamentary proceedings in 1921. Prior to this moment, the House of Commons and Senate had had two different homes. At the advent of Confederation in 1867, Canada’s bicameral system sat atop Parliament Hill. Until the mid-1910s, however, the building looked very different from the Centre Block that Canadians know today. It was smaller and the Peace Tower was nowhere to be found. Instead, the Victoria Tower and a High Victorian Gothic Revival style greeted both Parliamentarians and visitors into Canada’s legislative chambers. On February 3, 1916, a major fire broke out in the Parliament of Canada. Seven lives were lost that night, and everything burnt to the ground with the exception of the Library of Parliament. The iron doors at the entrance of the library helped prevent the spread of the fire into the literary collection. After this devastating moment, Parliament moved into its second home: the Victoria Memorial Museum (now the Canadian Museum of Nature). Only 4 years after the fire, in 1920, Centre Block stood unfinished but nonetheless reopened its doors with a lavish ceremony to celebrate. In 1927, the Peace Tower was inaugurated, officially ending the construction one of the country’s most iconic buildings. 1927 was the last time that Centre Block underwent any sort of significant restoration or renovation work. According to Public Works, if the building were to remain open until 2025, it would be at risk of “total failure.” Currently, the structural steel is rusting; mechanical failures affect the feasibility of parliamentary operations; there are cracks in the masonry due to seismic damage; and the roofs, windows, and plumbing are leaking which is damaging the building’s interior. Those who worked in Centre Block also lacked modern-day amenities such as air conditioning and centralized heating. The truth is: the building is simply no longer functional. Thanks to a longstanding parliamentary tradition that no decorations or artwork can be permanently removed from Parliament once installed, Centre Block is going to look nearly identical to the building that Canadians recognize as the home of their democracy when it reopens in 10-15 years. Behind the 20th century stone carvings and impressive architecture, however, it will have transformed into a modern 21st-century edifice. 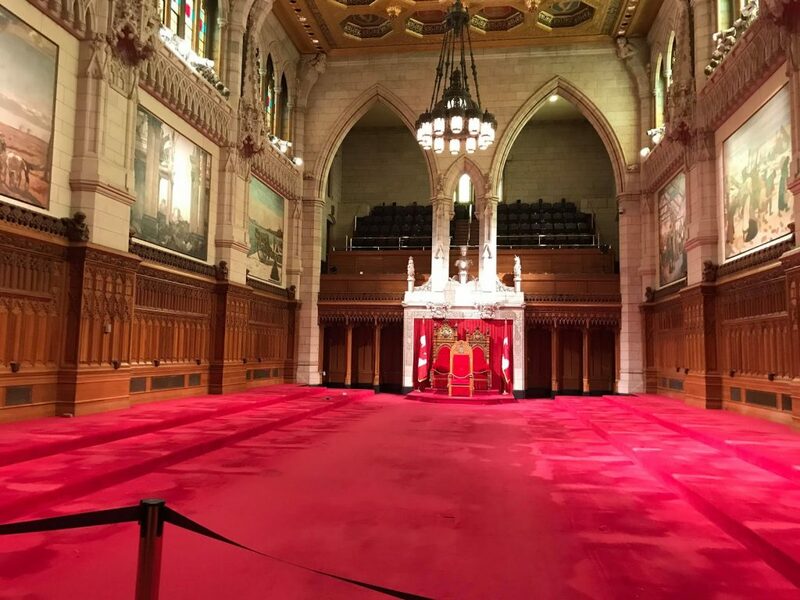 The empty Senate in Centre Block. Photo by Katherine Cuplinskas. What Happens When It’s All Over? When Centre Block’s restoration and renovation process is completed in 10 to 15 years, it will once again welcome Parliamentarians and visitors. At that time, what will happen to West Block and the Senate of Canada Building? Once again, uncertainty prevails. West Block, the temporary home of the House of Commons, will likely be reverted to its original purpose and house office space for parliamentarians. The Senate of Canada Building, on the other hand, may turn back into the Government Conference Centre, or be repurposed for another use. The newly created chambers in both buildings could also serve as large committee rooms, or be divided into smaller meeting spaces. Only time will tell, but the beautiful new spaces will serve Canadian politicians long beyond the next 10-15 years. Seeing one of Canada’s most iconic buildings, the symbol of Canadian democracy, close its doors for over a decade is no small matter. 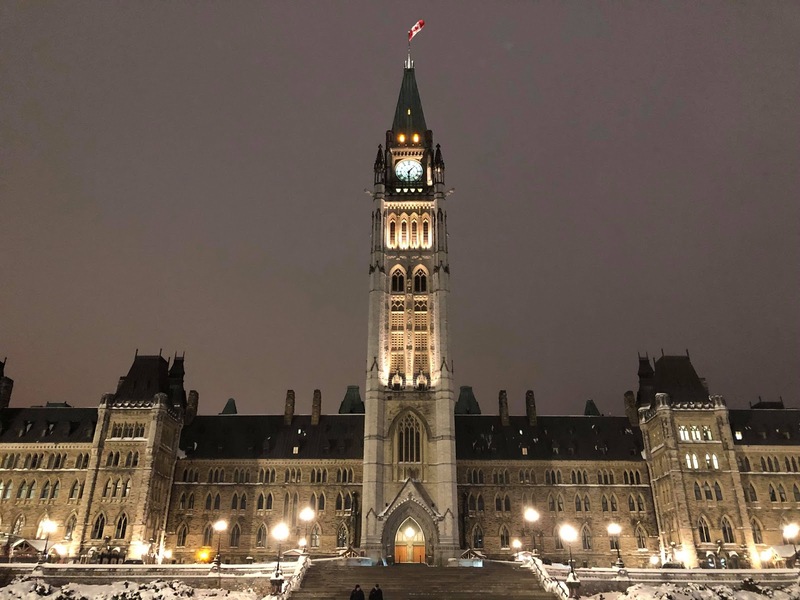 Traditions and parliamentarians will have to adapt to new surroundings, and Canadians will have to come to terms with the idea that the iconic building, colloquially known as “Parliament,” no longer houses Parliament. When future parliamentarians return home to beloved Centre Block, however, they will be greeted with a 21st-century building ready to tackle the challenges of the day. Until then, Canada’s Parliament will keep calm and carry on. Feature image by Katherine Cuplinskas.